See the special "SNL" clip and what Dana Carvey, who used to play the 41st president, said. During this week's "Saturday Night Live," the cast paused to pay tribute to President George H.W. Bush, a man who had once been the subject of the show's jokes and impersonations. During "Weekend Update," the segment's co-host Michael Che said: "On a serious note, Friday night, former president George H.W. Bush passed away. He was 94 years old. Our thoughts and condolences go out this family and friends." Co-host Colin Jost chimed in, saying: “That’s right. President Bush, who famously was a warm and gracious man who always understood the power in being able to laugh at yourself. So, take a look,” Colin Jost added. Then a clip aired of "SNL" alumni, comedian Dana Carvey in one of his most famous roles, playing the 41st president, as well as George H.W. Bush's then-reaction to it. Carvey made a name for himself using grand hand gestures and funny lines, including the memorable "Not gonna do it," "Wouldn't be prudent." 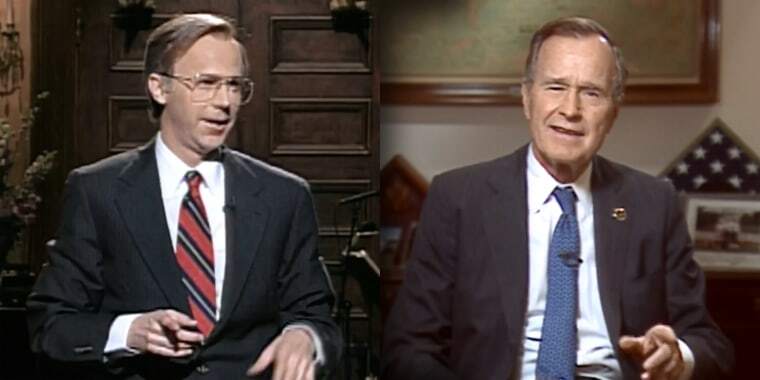 In his retort to Carvey on a 1994 episode, Bush remarked that the impression was nothing like him, saying, "It's bad, it's bad." All jokes aside though, Carvey and Bush respected each other and even shared a few nice moments together. In 1992, Carvey was invited to the White House to meet Bush. "Dana has given me a lot of laughs," the president said during the occasion. "And the fact that we can laugh at each other is a very fundamental thing." In later years, they continued to stay in touch and traded letters, forming an unlikely but solid friendship. Following the news of his death on Friday, Carvey issued a statement about the man who he famously impersonated on television each week, and who ended up becoming a lifelong friend. "It was an honor and a privileged to know and spend time with George H.W. Bush for over 25 years. When I think of those times what I remember most is how hard we would laugh. I will miss my friend," said Carvey. It's certainly a testament to the type of person George H.W. Bush was, as his granddaughter, TODAY correspondent Jenna Bush Hager pointed out, speaking with Hoda in 2016 about her grandfather's appreciation for Carvey. "After he lost the election to Bill Clinton he invited Dana to the White House to make all of his staff laugh," she revealed. The world echoes Carvey's statement that our dynamic and multifaceted former president will surely be missed.